This name uses Spanish naming customs: the first or paternal family name is Cánovas and the second or maternal family name is del Castillo. 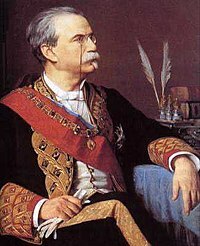 Antonio Cánovas del Castillo (8 February 1828 – 8 August 1897) was a Spanish politician and historian known principally for serving six terms as Spanish Prime Minister, his role in supporting the restoration of the Bourbon monarchy to the Spanish throne and for his death at the hands of an anarchist, Michele Angiolillo. Born in Málaga as the son of Antonio Cánovas García and Juana del Castillo y Estébanez, Cánovas moved to Madrid after the death of his father where he lived with his mother's cousin, the writer Serafín Estébanez Calderón. Although he studied law at the University of Madrid, he showed an early interest in politics and Spanish history. His active involvement in politics dates to the 1854 revolution, led by General Leopoldo O'Donnell, when he drafted the Manifesto of Manzanares, which accompanied the military overthrow of the sitting government, laid out the political goals of the movement, and played a critical role as it attracted the masses' support when the coup seemed to fail. During the final years of Isabel II, he served in a number of posts, including a diplomatic mission to Rome, governor of Cádiz, and director general of local administration. That period of his political career culminated in his being twice made a government minister, first taking the interior portfolio in 1864 and then the overseas territories portfolio in 1865 to 1866. After the 1868 Glorious Revolution (Revolución Gloriosa), he retired from the government, but he was a strong supporter of the restoration of the Bourbon monarchy during the First Spanish Republic (1873–1874) and as the leader of the conservative minority in the Cortes, he declaimed against universal suffrage and freedom of religion. He also drafted the Manifesto of Sandhurst [es] and prevailed upon Alfonso XII to issue it, just as he had done years previously with O'Donnell. Cánovas returned to active politics with the 1874 overthrow of the Republic by General Martínez Campos and the elevation of Isabell II's son Alfonso XII to the throne. He served as Prime Minister (Primer presidente del Consejo de Ministros) for six years starting in 1874 (although he was twice briefly replaced in 1875 and 1879). He was a principal author of the Spanish Constitution of 1876, which formalised the constitutional monarchy that had resulted from the restoration of Alfonso and limited suffrage to reduce the political influence of the working class and assuage the voting support from the wealthy minority becoming the protected status quo. Cánovas Del Castillo played a key role in bringing an end to the last Carlist threat to Bourbon authority (1876) by merging a group of dissident Carlist deputies with his own Conservative party. [specify] More significantly, his term in office saw the victory achieved by the governmental Spanish troops in the Third Carlist War, the occupation of the Basque territory and the decree establishing an end to the centuries-long Basque specific status (July 1876) that resulted in its annexation to a centralist Spain. Against a backdrop of martial law imposed across the Basque Provinces (and possibly Navarre), heated negotiations with Liberal Basque high-ranking officials led to the establishment of the first Basque Economic Agreement (1878). An artificial two-party system designed to reconcile the competing militarist, Catholic and Carlist power bases led to an alternating prime ministership (known as the turno pacifico) with the progressive Práxedes Mateo Sagasta after 1881. He also assumed the functions of the head of state during the regency of María Cristina after Alfonso's death in 1885. By the late 1880s, Cánovas' policies were under threat from two sources. First, his overseas policy was increasingly untenable. A policy of repression against Cuban nationalists was ultimately ineffective and Spain's authority was challenged most seriously by the 1895 rebellion led by José Martí. Spain's policy against Cuban independence brought her increasingly into conflict with the United States, an antagonism that culminated in the Spanish–American War of 1898. Second, the political repression of Spain's working class was growing increasingly troublesome, and pressure for expanded suffrage mounted amid widespread discontent with the cacique system of electoral manipulation. During a religious procession in 1896, at Barcelona, a bomb was thrown. Immediately three hundred men and women were arrested. Some were Anarchists, but the majority were trade unionists and Socialists. They were thrown into the notorious prison at the fortress of Montjuïc in Barcelona and tortured. After a number had been killed, or had gone insane, their cases were taken up by the liberal press of Europe, resulting in the release of a few survivors. Reputedly it was Cánovas del Castillo who ordered the torture, including the burning of the victims' flesh, the crushing of their bones, and the cutting out of their tongues. Similar acts of brutality and barbarism had occurred during his regime in Cuba, and Canovas remained deaf to the appeals and protests of civilized conscience. At the same time, Cánovas remained an active man of letters. His historical writings earned him a considerable reputation, particularly his History of the Decline of Spain (Historia de la decadencia de España) for which he was elected at the young age of 32 to the Real Academia de la Historia in 1860. That was followed by elevation to other bodies of letters, including the Real Academia Española in 1867, the Academia de Ciencias Morales y Políticas in 1871 and the Real Academia de Bellas Artes de San Fernando in 1887. He also served as the head of the Athenaeum in Madrid (1870–74, 1882–84 and 1888–89). Cánovas's tomb at the Panteón de Hombres Ilustres in Madrid. 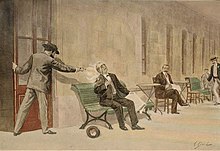 In 1897, he was shot dead by Michele Angiolillo, an Italian anarchist, at the spa Santa Águeda, in Mondragón, Guipúzcoa. He thus did not live to see Spain's loss of her final colonies to the United States after the Spanish–American War. The policies of repression and political manipulation that Cánovas made a cornerstone of his government helped foster the nationalist movements in both Catalonia and the Basque provinces and set the stage for labour unrest during the first two decades of the 20th century. The disastrous colonial policy not only led to the loss of Spain's remaining colonial possessions in the Pacific and Caribbean but also seriously weakened the government at home. A failed postwar coup by Camilo de Polavieja set off a long period of political instability, which ultimately led to the collapse of the monarchy and the dissolution of the constitution that Cánovas had authored. 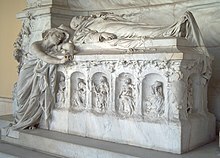 His white marble mausoleum was carved by Agustí Querol Subirats at the Panteón de Hombres Ilustres, in Madrid. ^ Karnow, Stanley (1989). "Antonio Canovas". In Our Image: America's Empire in the Philippines. Random House. ISBN 978-0394549750. ^ "Canovas nunca morirá". Archived from the original on 2015-09-20. ^ Goldman, Emma. "The Psychology Of Political Violence". Anarchism And Other Essays. Gutenberg. Wikimedia Commons has media related to Antonio Cánovas del Castillo. Chisholm, Hugh, ed. (1911). "Canovas del Castillo, Antonio" . Encyclopædia Britannica. 5 (11th ed.). Cambridge University Press. pp. 206–207. The original version of this article draws heavily on the corresponding article in the Spanish-language Wikipedia, which was accessed in the version of 6 September 2007. This page was last edited on 11 April 2019, at 14:40 (UTC).